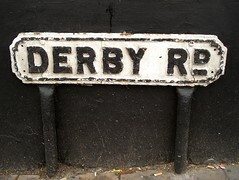 Derby Road runs west from the point where North End turns into London Road, roughly opposite West Croydon Station. At its far end are Pitlake and Mitcham Road. Last edited 2013-11-28 19:20:10 (version 2; diff). List all versions. Page last edited 2013-11-28 19:20:10 (version 2).